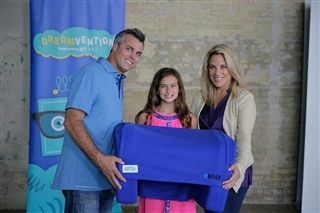 A Barstow fifth grader is a finalist in the inaugural “Dreamvention” contest, hosted by Frito-Lay Variety Pack Brands, for a product she created for the school’s Invention Fair last spring. Julia Luetje entered her Storm Sleeper in the contest, which recognizes students’ boundless imagination and creativity in “dreamventing” solutions to everyday problems. Julia’s invention was one of five chosen from 13,000 submissions from across the country. Those finalists will compete for America’s votes to win the grand prize of $250,000. Julia is the only finalist not just from Kansas City, but also throughout the entire region. Other finalists are from Texas, Indiana, New York and Massachusetts. She said she was surprised to learn she had been selected during a trip to Austin, Texas, with her parents, Chucker Luetje and Susan Bernstein ‘88. Julia came up with the idea for her invention during a thunderstorm, when she used pillows to muffle the rumble outside. Her Storm Sleeper design consisted of pillows supported by fabric at the top along with Bluetooth speakers inside that play soothing music. “A lot of people have mentioned the impact this could have not just for people who don’t like storms, but for people with all kinds of sensory sensitivity or even for pets,” Bernstein said. Julia definitely sees that potential. “My invention can really help people if you’re afraid of storms, but also if you have loud siblings, pets or parents who snore,” she said. Julia’s mom said her daughter took the initiative to enter the contest on her own after learning about it while watching the “Ellen” show. Finalists competed for a $250,000 grand prize during an online voting contest in October and November. The winner will be announced in mid-December. Good luck, Julia!